Songs play through as listed on the cover. 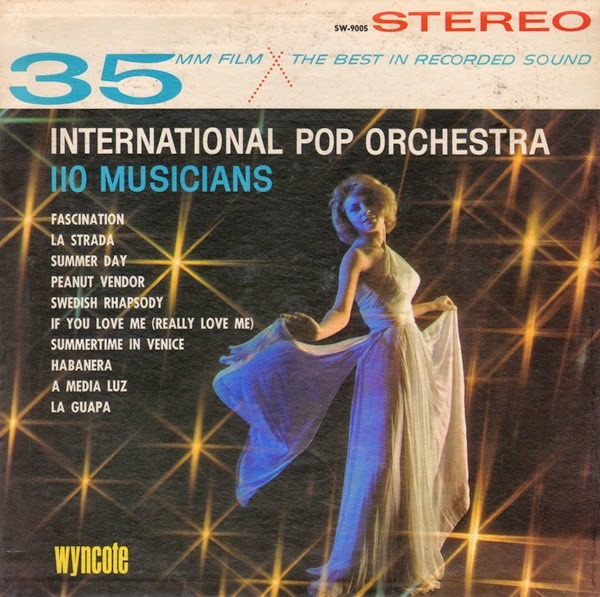 From the back cover: Consisting of 110 hand-picked musicians, the International Pop Orchestra is almost unique in the world today – a full-fledged symphonic orchestra created solely for the purpose of playing popular music. It's string section alone numbers 58 members and is augmented by such unsymphonic instruments as guitars and mandolins. Also contributing to the almost-overwhelming sound of this unusual ensemble are bongos, timbales, a variety of unusual rhythm instruments and a grand theatre organ! Apparently this album concept was designed to lure mathematicians and people who don't subscribe to the theory that "less is more". If you are counting, this budget "lush string" album sounds LP pretty good compared to many of the period.